Born in Toronto, Canada and raised in the suburbs to the west, Steve had a variety of occupations while attending high school and college. He worked as a steam fitter, a car jockey, a postman, a lab technician, and an elementary school teacher. Although the entertainment business had always been a weekend hobby, Steve went full time in 1981 when he began touring Canada and the U.S. in a rock band called Jason. In 1974, he and his wife left the band to form the comedy duo of "Smith & Smith", opening for such entertainers as Rick Nelson, Roy Orbison, Al Martino, Helen Reddy, Martin Mull, and more. In 1978, "Smith & Smith" began a successful run on Canadian television with their own series which ran for nine years. 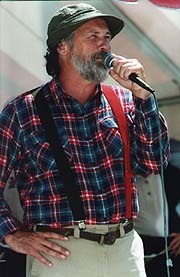 It was during this period that Steve's most popular alter ego "Red Green" was created. Steve wrote and produced all 195 episodes. "Smith & Smith" won several awards including the Iris Award at NATPE '85 in San Francisco. Expanding from "Smith & Smith", Steve wrote and produced 26 episodes of "Me & Max", followed by 60 episodes of "The Comedy Mill", winning a Gemini Award for the latter. In his spare time he was Head Writer of a 13 episode series called "Laughing Matters" for the Global Television Network and wrote a pilot called "Out Of Our Minds" starring David Steinberg for Tribune Entertainment. As a slight departure, Steve wrote for 3 episodes of "Top Cops" for CBS International. Steve's latest project is "The New Red Green Show" which he stars in, produces and co-writes with ex-Frantic Rick Green. Steve has done 72 episodes to date which are currently being run coast to coast in Canada and throughout several countries in the world including Australia, Korea, Fiji, Trinidad, Turkey, and of course, the United States. Steve is currently on a busy schedule of promotional appearances and production duties and answering letters from "The Red Green Fan Club" which now boasts over 5,000 members. Winner of CanPro Awards for local and syndicated programs, NATPE Iris Award, and Gemini Award (Canada's top television honour). Nominated for five Gemini Awards.